Like her elusive wild relatives, Helen—Woodland Park Zoo’s newest snow leopard—made herself hard to spot during her official debut this morning at the snow leopard exhibit. TV and newspaper cameras scrambled to catch a glimpse of the beautiful feline as she crept around trees and hid behind rocks, shyly exploring her new home and the different scents her keepers scattered around the space. Helen, a 3-year-old snow leopard, joins us from Tautphaus Park Zoo in Idaho. Here at WPZ, she’ll make her home with two other snow leopards, 14-year-old Nadia, and 2-year-old Tom. The cat’s name carries on the legacy of devoted snow leopard conservationist Helen Freeman (1932-2007), founder of the Snow Leopard Trust, a WPZ partner for conservation. Together with the Snow Leopard Trust, we’ll be hosting the second annual International Snow Leopard Day event at the zoo this Saturday, August 23, from 9:30 a.m. to 3 p.m.
At the event, learn all about snow leopard research and conservation in the wild and find out how you can help. Enjoy crafts, face painting, live music, and more for the whole family. 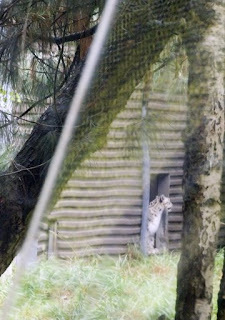 Top: Helen makes her first appearance in Woodland Park Zoo's snow leopard exhibit. Bottom: A close-up of Helen. Shade-grown coffee is coffee that’s grown under the rain forest canopy and usually on family-owned farms with traditional methods (without chemicals). Leaving the existing rain forest intact protects the coffee plants from the weather and keeps the soil healthy. This practice also provides habitat for local wildlife and shelter for migrating birds. Some of these birds even visit us here! Tanagers, Warblers, Thrushes, Rufous Hummingbirds, Flycatchers, Vireos, Purple Martins, Sparrows, and many others are all birds that spend their winters in South American coffee territory and have been seen around the zoo during the summer. 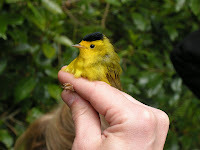 These birds are among those celebrated in May’s International Migratory Bird Day (http://www.birdday.org/)! If you’re interested in supporting ethical farming and protecting migratory birds, check out http://www.shadecoffee.org/, and look for Bird Friendly or Rainforest Alliance certified products in your local supermarket. You can also find certified shade-grown coffee in our Zoo Store! Have you ever had mango salsa with peanut butter for breakfast? The orangutans have! Every morning, keepers send in ‘grocery lists’ to the Commissary, where all the animals’ food is kept. Then keepers and Zoo Corps interns check the lists and fill plastic tubs from the hay barns, giant refrigerator, and deep freezer. When the bins are filled, a zoo pick-up truck delivers the orders to the hungry animals. Many people have fun stories from their time in the Commissary. Once, a Zoo Corps intern got his wet shoes frozen to the floor of the deep freezer! Another worker spilled coffee on the floor and spent a few days trying to clean up the frozen puddle. While coffee isn’t normally found in the freezer, bags of frozen mice and fish are. The refrigerator holds everything from melons and yams to grape juice and yogurt. In the kitchen, the shelves are stocked with Ensure for older animals, vitamins, graham crackers, bread, popcorn, and the five gallon buckets for one of the bears’ favorite treats: bloodsicles. We don’t know about you, but we prefer our popsicles in cherry and lime! 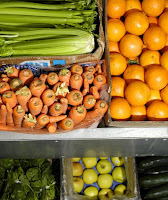 Top: Fresh produce for the animals at the zoo's commissary. Photo by Ryan Hawk. Bottom: Visitors watch as a grizzly bear enjoys a "bloodsicle" treat made by commissary workers. Photo by Ric Brewer. Congratulations Lindsay H. and Megan A., our two ZooTunes VIP Ticket Giveaway trivia contest winners! 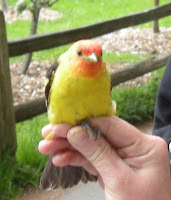 Look for emails from Woodland Park Zoo to find out how to claim your prize. Thanks to all who took a stab at these tricky zoo trivia questions for a chance to win two VIP tickets to The Avett Brothers with Shawn Mullins ZooTunes concert. Curious about the answers? Here they are! Keep an eye out for more contests to come. Deep in the confines of the zoo, something hatches…. ...and it's hungry. Teams of Zoo Corps interns, zoo keepers and volunteers battle hordes of slimy slugs and strangling weeds to find the most perfect, tiny leaves for its greedy mandible. Who is this ominous-sounding creature, you may ask? It's the Oregon silverspot butterfly, a threatened species that lives only in the meadowlands of Oregon, where its sole source of food—the Western Blue Violet—is found. 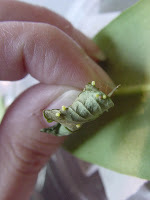 Since 1999 Woodland Park Zoo has had a behind-the-scenes program involving hatching, raising and releasing into the wild batches of silverspot caterpillars to help boost the wild population. Because caterpillars of all species are known for being voracious eaters, a major part of the program is harvesting leaves from the violets grown by our Horticulture Department and feeding them to the ever-hungry larvae. There’s also a fair bit of slug relocating (Zoo Corps has a competition to see who can take the most slugs from the delicious violets to Zoomazium’s backyard), dishwashing (everything in the butterfly lab must be kept absolutely sterile to ensure the caterpillars’ health), and paper cutting for caterpillar bin liners and pupa papers. It’s hard work, but it’s all worth it! If these feisty little buggers have spun their cocoons around your heart, then flutter on over to our website to learn all about our silverspot conservation program. Top: Tiny silverspot butterfly eggs on a leaf. Photo by Dana Payne. Bottom: Newly released silverspot butterfly in Oregon. Photo by Erin Sullivan. VIP seating for the concert! 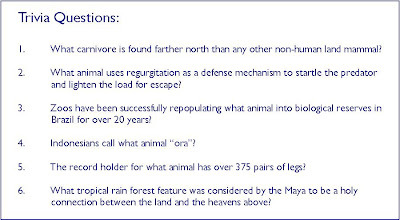 To enter, just correctly answer the zoo trivia questions below. Two winners will be drawn at random from all eligible respondents with the correct answers. Not sure of the answers? Browse our website or visit the zoo to look for hints. Think you know the answers? Email webkeeper@zoo.org with your guesses through Sunday, 8/17, 10 p.m. PST. Only one entry per individual, so encourage your friends to enter as well! Two winners will be selected at random on Mon., 8/18. Most people don't think of snails as being endangered, particularly if they are battling them as they eat through their Swiss chard patch. But Woodland Park Zoo is helping a species of Tahitian tree snail back into their rightful place. 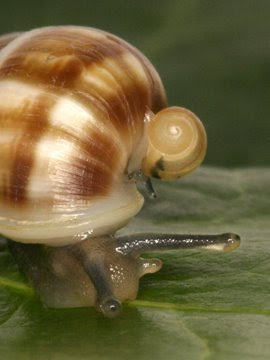 The Partula snail used to be represented by around 100 different species in the islands of French Polynesia. But thanks to (or no thanks, in this case) an invasive, and carnivorous, snail, Partula were reduced to about five species in less than 10 years in the 1980s, and only remnant survivors of those few remaining populations. Thankfully, scientists recognized what was happening and rescued about 17 species before they disappeared. Our zoo has been the U.S. hub at captive breeding efforts for one of these species, Partula nodosa, and currently has more than 900 of these half-inch long critters behind the scenes in Bug World. A rarity in the snail world, Partula give live birth to a single offspring every 4-6 weeks, as opposed to a typical brown garden snail that lays hundreds of eggs each year (in fact, Partula or Parca is the Roman goddess of live childbirth). Slo-o-o-w growers (sorry for the pun! ), they can live up to around 5 to 6 years. Plans are underway to reintroduce P. nodosa back to Tahiti in the next couple of years in what is being billed as the world's smallest wildlife preserve: an approximately 20 meter square protected site that will contain the released specimen. The first step is shipping some of our snails to London's (U.K.) Imperial College for a study to ensure the viability of the snails and to make sure that no nasty pathogens or parasites would be released with them (you always want to make sure that you're not releasing something worse than what originally caused the problem in the first place!). So hopefully before September, a small number of our snails will be safely packed away and headed off on a flight to Heathrow. While big, most Komodo dragons don’t reach quite that size, averaging between 6.5 to 10 feet and weighing in at around 150 pounds. Komodo dragons are the vultures of the four Eastern Indonesian islands they inhabit: they eat carrion. That doesn’t mean, however, they won’t eat other things as well, including hatchling Komodo dragons, whose survival instincts have them scurrying up trees, where they stay until large enough to not be such easy snacks for the adults. WPZ has provided funding to the Komodo Survival Program since 2000. The group’s recent study examines the spatial ecology of juvenile Komodo dragons. Huh, you ask? Field researchers captured 5 hatchling and 7 juvenile dragons to study where young Komodo dragons hang out, basically. Transmitters were attached to the dragons’ tails using duct tape, and positions recorded via GPS. Neither group moved at night: Komodo dragons’ eyes lack rods, and since they have only cones, it is believed they have poor night vision. Researchers also found that hatchling Komodo dragons are arboreal, while larger juveniles are terrestrial. Diet and avoidance of predation from other dragons seem to be factors contributing to hatchling behavior. By understanding the habitat requirements of dragons, researchers hope to improve species management. For more information about the zoo’s conservation programs, check out our conservation homepage: http://www.zoo.org/conservation/conservation.html. We were greeted with sunny skies yesterday morning for this summer's western pond turtle release. Twelve endangered turtles, headstarted for a year at the zoo, were taken to a protected pond site in the Lakewood area for the next step in their life cycle: life in the wild. A full contingent of helpers, including zoo staff and volunteers, 7-year-old Aimee Kessler and project donor Maryanne Tagney Jones, received the honor of gently putting the little turtles, weighing around 2 ounces each, into the waters of their new home. State biologists Michelle Tirhi and Tammy Schmidt checked over the turtles, ensuring that they were correctly marked (small notches are made in their shells for future identification, as well as tiny numbered tags). Michelle notes that the project has had a 95% rate of success in raising turtles since 1996. But we'll let the photos speak for the day. The zoo has proudly worked on this project for nearly two decades, increasing the wild population of these turtles from as few as 100 to more than 1,400 today.